We turn the spotlight on three Le Tote staffers from the Marketing squad who do denim. Every. Single. Day. I love high waisted pants that are loose on the thighs to create a casual but trendy western look. How many pairs of jeans in your closet? I believe I have 7 pairs, but two of them are on most-frequent rotation. 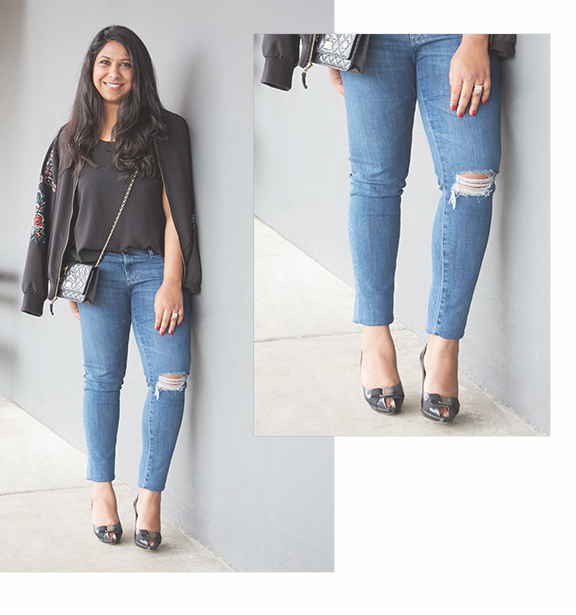 I have a classic skinny jean that can do the weekend, running-errands look just as easily as a date night look. The second is a trendy high-waisted pair that I got altered to be slightly snug, and also cropped to show off my ankles. What is the most out of the box look you’ve attempted with denim? I found these Wrangler men’s denim at a thrift store and they fit perfectly. My other denim experiment was overalls. Both the looks are out of the box for me and finding the right top can be challenging but when it works, oh boy it works! I do denim, day in and night out. My go-to style is a classic, mid-rise skinny no matter what is ‘trending’. Let’s just say I am not a risk-taker when it comes my denim choices so cropped, frayed and patchwork jeans never make their way into my closet! How do you dress denim for after-hours? It really depends on the after-hours in question. Dressed up denim often involves a dramatic third piece like a flowy chiffon layer (preferably made in India, featuring a gorgeous hand blocked print), high-ish heels, a classic handbag or statement jewelry — sometimes it’s just one element; sometimes I need it all. And then there are times when a bold red lip gets the job done. What’s the fanciest occasion you’ve dared to wear denim? I wore denim to the War Memorial Opera House once! Emily wears her fave black denim that she recently scored from Le Tote. “I wore it with a neutral blazer but incorporated a pop of color via the top.” Comfy wedges and a statement necklace seal the deal. Denim is my everyday staple. Every morning, outfit planning begins with denim and the rest of the pieces follow suit. I think I own more pairs of jeans than I own anything else in my closet! What is the secret to nailing the perfect jeans from Le Tote? It’s simple — if there’s a style of denim available on the site that I am interested in, I try it. I’ve purchased a few different pairs and the system has figured out what works for me and tends to give me good recommendations. It’s not perfect every time but I am always willing to try because, to me, finding jeans that fit is a real success. So there’s no real secret — just rate your totes and be open to some trial and error. Your top styling tricks to make denim work for work? Fun shoes, polished layers and lots of diversity in terms of tops, blazers, jackets, scarves to mix and match, and help dress up or down your denim. Previous Post Fashion FAQ: How Do I Accessorize with Belts? It would be great if when you were putting together your tote you would have links to the other items the model is wearing. I love the look but have to go hunting for all of the pieces separately. Make it easy for me to copy the look. Thanks for your suggestion! We’ll make sure this note gets shared with the right team here at HQ.